Walt Disney left the academic analysis to the professionals and the popular analysis to his audiences. He knew what they liked and they loved what he did. Disney was a storyteller foremost who, early on, used the film medium to its maximum potential and later applied his genius for spinning worlds of fantasy to his magical theme parks. 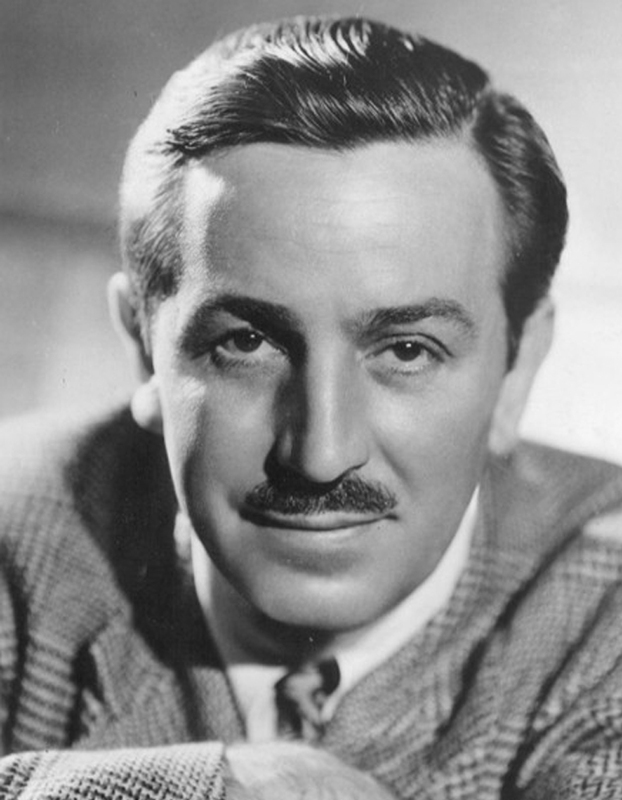 While Disney’s fame and following came from his talent for popular entertainment, he pioneered technological innovations and a passion for excellence unparalleled in the annals of entertainment history. Disney Studio made the first animated film with synchronized sound when it made Steamboat Willie in 1928, the third Mickey Mouse cartoon to be produced but the first to be released. The studio was also the first to synchronize animation and classical music with The Skeleton Dance, the first in a musical series called The Silly Symphonies, which were started in 1929. The Disney Studio made the first film, animated or live-action, with three-color Technicolor when it made the Academy Award-winning Flowers and Trees in 1932. The vibrant colors in Disney’s early films are still intact in reissues seen today. Disney was the first filmmaker to put an orchestration of abstract forms in a commercial film, Fantasia, which featured in its 1940 debut, stereo, multi-channel sound. And finally, the Disney staff developed the multi-plane camera which made it possible, for the first time, to use live-action camera movements for filming animation sequences. More important than the Disney Studio firsts were the ways in which Disney integrated technical advances into his films. At a time when most live-action filmmakers used music as merely a mood-maker, Disney soundtracks used music, sound effects and dialogue to develop the personalities of characters. Disney also used sound with images to reflect the pace and rhythm of scenes. The Three Little Pigs (1933) is one of the early shorts which demonstrates Disney’s virtuosic use of sound as well as his manipulation of color to enhance the action and emotions of his characters. The “Practical Pig” plays on his brick piano, a musical accompaniment to the action of the wolf trying to blow his house down. The wolf, in turn, literally blows himself blue in the face. For Snow White and the Seven Dwarfs, Disney’s first animated feature, the color was keyed sequence by sequence for hue and intensity to match the action from climax to climax. Snow White was produced at the unheard cost of $1,449,000 during the depths of the Depression. It received universal acclaim when it premiered in 1937. As in all Disney’s productions, nothing was left to chance. The film is tightly structured so that each frame contributes to the unfolding of the plot.Snow White was followed by other features such as Pinocchio, Fantasia, Dumbo andBambi, which more extensively utilized the multi-plane camera. Pinocchio has been called the finest animated film ever made and one whose technical sophistication has never been surpassed. Disney strove for an idealization of real life rather than for realism. Countless tests were shot of every scene before the final filming was approved. Pencil sketches were photographed both in black & white and color, reviewed for critical analysis, and then finished on celluloid sheets. For any one feature, hundreds of key scenes would be completely painted with minute variations of composition and hue until the perfect effect was achieved. For a greater sense of realistic movement, live-action versions were filmed so that animators could study the body movements of the actors. In addition, the studio created scale models of characters and in some cases, prop objects, to enhance the three-dimensionality of the animation. By 1940, the newly completed Burbank studio employed more than 1,000 artists, animators, storymen and technicians. Disney personally supervised the origin, development and completion of all pictures made in the studio. So meticulous was he that when dissatisfied with Pinocchio, he completely scrapped five months of finished product. In the 1940s and 1950s, Disney tackled a new area of endeavor, live-action films such as Treasure Island and 20,000 Leagues Under the Sea, and the award-winning nature series, True-Life Adventure. During World War II, the studio produced instructional films to aid in the war effort and propaganda films to boost morale overseas and at home. The culmination of Disney’s work in animation and live-action filmmaking was, without question, Mary Poppins, released in 1964. Seamlessly marrying live actors into an animated setting and animated characters into live-action footage, Mary Poppins became one of the greatest hits in the history of the motion picture industry. Walt Disney was truly the film Aesop of the twentieth century. He and members of his creative staff received more than 950 honors and citations from every nation in the world, including 48 Academy Awards and seven Emmys. Disney’s television show, Disneyland, laterWalt Disney Presents, which he hosted for twelve years, premiered in 1954. When the show switched from ABC to NBC, the name change, Walt Disney’s Wonderful World of Color, reflected the prestigious color offerings of the network and the program. The series retained solid ratings for twenty years and has recently been revived. To build his park, Disney enlisted a group of his top animators and motion picture designers and put together an organization of “Imagineers.” Disneyland was not planned as a traditional amusement park, but as a series of extraordinary storytelling environments in which the architecture, landscaping, costuming, sound effects, entertainment, and even food and merchandise, combine to make the visitor a participant in a highly theatrical experience—an experience which has been enjoyed by more than 250 million visitors since the park’s opening. Disney’s penchant for technical innovation was soon reflected in Disneyland, first with the advent of Audio-Animatronics, a computerized system that brings voice and movement to a cast of life-like robotic figures, from singing grizzly bears to pillaging pirates. Innovative public transit systems were also introduced at Disneyland, including America’s first daily-operating monorail system and a silent, electric-powered PeopleMover. Disney had the opportunity to export the Disneyland experience outside the park’s boundaries in 1964, when he developed four shows for the New York World’s Fair. “The Carousel of Progress” for General Electric, “Ford Wonder Rotunda,” “Great Moments with Mr. Lincoln” for the State of Illinois and “It’s A Small World” for Pepsi Cola and UNICEF, were four of the five most popular shows at the Fair. Walt Disney gave his Imagineering staff a chance to prove their skills in community planning when, in the mid-1960s, his organization acquired 28,000 acres of land in central Florida for Walt Disney World. Opened in 1971, five years after Disney’s death, Walt Disney World grew to encompass the Magic Kingdom park, themed resort hotels, campgrounds, recreation facilities, a shopping village, vacation home community, and a complete transportation network including monorails, watercraft, steam trains and PeopleMovers. In 1982 the Disney organization realized Disney’s dream for a community of ideas, research and cultural opportunities with the opening of EPCOT Center at Walt Disney World. Disney’s theme park concept has now proved its international appeal with the opening of Tokyo Disneyland in 1983 and plans for a EuroDisneyland to be built just outside Paris, France. One of Walt Disney’s final accomplishments was the formation of a new school for the arts where a multi-disciplinary workshop approach would allow a “kind of cross-pollenization that would develop the best in students.” The California Institute of the Arts was built, shortly after Disney’s death on a sixty-six acre site north of Los Angeles.